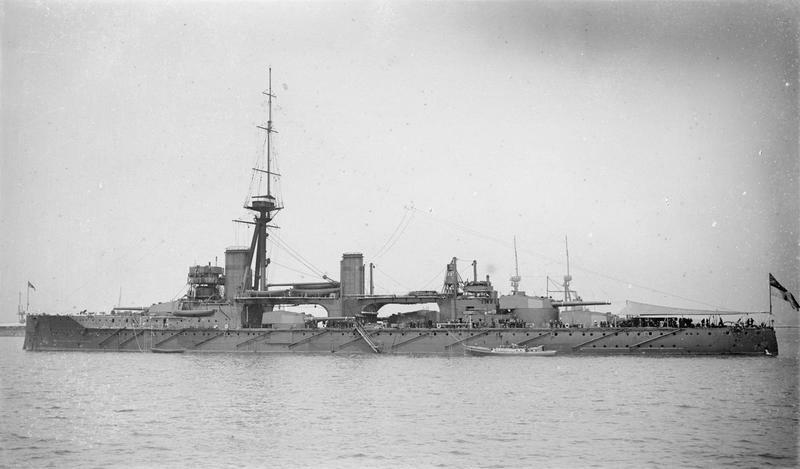 HMS Colossus shortly after completion. The "flying buttresses" were used to store the ship's boats. This design has been criticized on the basis that action damage could cause these structures to collapse and interfere with the amidships turrets. In addition, the foremast was located behind the stack so as to facilitate the placement of the boat cranes. This placed the spotting platform in the path of the funnel gasses, rendering the position nearly useless in many wind conditions. IWM photograph Q 38500. 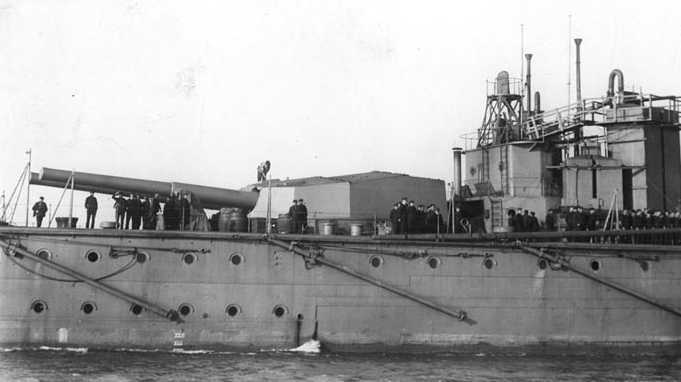 Developed to arm the "next generation" of dreadnoughts, this was a long-barrel 12" (30.5 cm) gun that used a larger propellant charge in order to achieve a higher muzzle velocity. Unfortunately, these new weapons proved inaccurate, as the heavier charge did not always fully combust before the shell left the muzzle. This resulted in unpredictable muzzle velocities and thus a varying range for the same elevation. Following one set of exercises, Lord Fisher recorded that the salvo shell patterns were spread over two or three acres (1 to 1.5 hectacres). The higher muzzle velocities achieved also resulted in these guns having a relatively short service life. There are some notes about barrel droop being an additional problem, but I have my reservations about the accuracy of those descriptions. As a result of the failure of these guns, the British implemented two significant changes. First, older ships with 12"/45 (30.5 cm) Mark X guns were modified so as to increase their maximum gun elevations. This allowed them to achieve longer ranges without increasing their muzzle velocities. Second, larger calibers were rushed into production for new ship construction, as their heavier projectiles would travel a longer distance at any given elevation for the same muzzle velocity. This meant that not only would they fire a heavier, more damaging projectile, but that they also would enjoy a longer liner life. Some publications claim that these weapons were used on the Indefatigable class battlecruisers, but all British 12" (30.5 cm) battlecruisers actually used the older - and shorter - 12"/45 (30.5 cm) Mark X guns. The Marks XI, XI* and XII were interchangeable and had similar ballistic performance. The Mark XI was a Vickers design and resembled the Mark X except that the screwed collar was replaced by a breech ring screwed to the rear jacket. One of these guns used on HMS Vanguard had a Holmstrom breech mechanism while the others used the same "pure-couple" breech mechanism as the Mark X. Mark XI* had a short B hoop overlapped by the jacket and the C hoop shrunk over the B tube and screwed onto the jacket. To counterbalance this, a D hoop was added over the jacket in front of the breech ring. As a result of these modifications, the XI* weighed a ton more than the Mark XI. The Mark XII was a similar design and the same weight as the Mark XI but differed from it by having more wire along the chase. The Mark XI gun breech mechanism was powered by a 3-cylinder hydraulic motor in place of the customary piston-rack assembly. Single guns with minor differences were also made to Elswick, Beardmore and Coventry Ordnance designs. Mark XI**, XI*** and XII* were proposed variations that were to have had alterations to the chamber slope for use at high elevations, but none of these were ordered. A total of 85 guns of all types were made. Some experimental work for these guns was carried out with pre-rifled 12" (30.5 cm) projectiles fired at muzzle velocities exceeding 3,000 fps (914 mps) and work was begun on converting one gun to a super velocity 8.071 inch (20.5 mm) gun, known as the 8-inch (20.3 cm) subcaliber Mark II. This was a continuation of the experimental work started with the 8-inch subcaliber Mark I. The work was cancelled at the end of the war. Projectile weights from ADM 186/169. The sources below disagree as to muzzle velocity, propellant charge weights and maximum ranges. I have chosen to use those values given in "Jutland: An Analysis of the Fighting." I do not have the dates as to when these ships were changed over to 4crh projectiles. "Greenboys" were issued starting in 1918. AP Cap weights were 34.75 lbs. (15.7 kg) for the Mark VIa and 99 lbs. (44.9 kg) for the Mark VIIa. Data from "British Battleships of World War Two" and represent an uncapped AP shell striking a plate at 90 degrees, i.e., with the axis of the shell perpendicular to the face of the plate. A capped shell would give about 10 to 20% improvement at low velocities and about 30 to 50% at high velocities. Note that the muzzle velocity was considerably higher than even that of new guns during the World War I period. See "Pre-War Armor Penetration" for comments regarding the actual penetration capabilities of British pre-war 12" (30.5 cm) AP projectiles. These were unique among British 12 in (30.5 cm) mountings in that they used a swash-plate training engine. 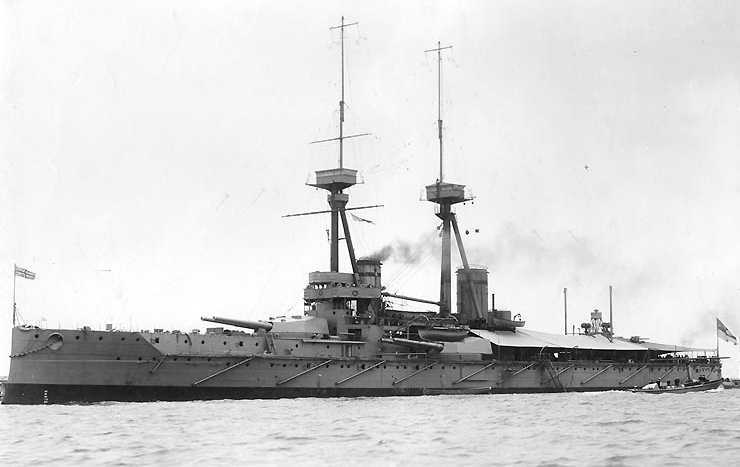 HMS Neptune had significant "firsts" for British battleships. She was the first equipped with a superimposed turret, the first to be able to fire a broadside with all main guns and the first to be fitted with a director sight. None of these "firsts" were entirely successful. As the turret sighting ports were open, the superimposed turret could not fire directly over the the lower one as this would have allowed blast and overpressures to penetrate into the lower turret. Stops were fitted to prevent this from occurring. During initial gunnery trials it was found that when the amidships turrets fired cross-deck that the deck sagged appreciably from the blast effect. Extra pillars and "Z" bars were fitted to strengthen these areas. Astern and ahead fire was also restricted for all turrets to angles greater than 5 degrees to prevent blast damage to the deck and superstructure. The original director did not live up to expectations and a modified version was installed in 1912 on HMS Thunderer which proved to be more successful. Similar to what had been found during gunnery trials with Neptune, when HMS Colossus fired cross-deck during the Jutland (Skagerrak) battle "the framing and deck supports were badly strained, especially after full-charges had been used" - R.A. Burt in "British Battleships of World War One." HMS Vanguard before World War I. Note that this later design had the stack behind the foremast. Note the 4"/50 (10.2 cm) gun on the stern turret protruding out of the awning. U.S. Naval Historical Center Photograph # NH 52618. Stern Turret on HMS Vanguard during the war. Note that the 4"/50 (10.2 cm) guns on top of the turret have been removed, thus dating this picture to sometime after the Jutland (Skagerrak) battle. U.S. Naval Historical Center Photograph # NH 52619.